There are over 3.7 billion email users globally and this number is expected to hit the 4.3 billion mark by the year 2022. That’s huge, and there lies a gigantic marketing opportunity through email marketing. And for every dollar you invest in email marketing, you get an average return of $38. To say the least, email marketing rocks! Actually, it is one of the most cost-effective and most useful tools for marketing your business. It is an extremely powerful way of reaching and engaging your audience. But like everything else in life, email marketing needs tools to be successful. Here we will explore the most useful email marketing tools for your e-commerce business. • When a client registers on your business after you download and install the app. • When a customer makes the first purchase from your business after you download and install the app. • When someone subscribes from popup or subscription box (these emails need to be synced into your business’s back-end). With this tool, everything is automated. Emails are carefully written according to the information you have provided and your customer’s behavior. After a single-click to install, you don’t need to fret about anything else; Happy Email team will take care of the rest. Among other things, Happy Email will help you connect with your clients, build customer trust, increase retention rate, and increase email deliverability. Note: Happy Email will only send emails to new clients, which means that admin accounts and accounts that are already present in your business won’t receive a “thank-you” email. As well, every client will only receive a single Happy Email cycle. Rare.io was designed for high development e-commerce businesses. It combines your client’s past purchase pattern with what they have recently bought or done on your business to automatically recommend products or services they are likely to purchase. With this tool, you don’t need to simply send emails according to the time zone; you send them based on your customers’ activities. The tool automatically sends your messages when your clients are most active and highly likely to make a purchase. Besides, you don’t base your marketing on bulk campaigns to increase sales. Furthermore, Rare.io helps you to send automated emails to order follow-ups, abandoned carts, welcome emails, and more. This ensures that you use the industry’s recommended practices to generate more sales. 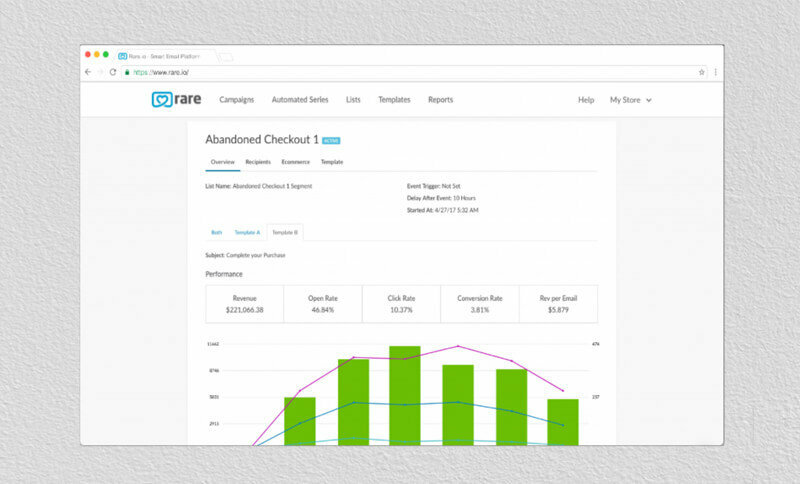 Key features of Rare.io include custom coupon codes and personalized recommendations. That ensures that you target clients based on existing niche that is based on the location of potential buyers and coupon usage. With an incorporated A/B testing feature, the tool promises up to 11 times the click and about 44% more sales than other emails. Note: Rare.io is free of the first 99 subscribers and you can send an unlimited number of emails. This is one of the world’s biggest marketing automated platforms. It is like a brain that helps e-commerce business –from small shops to big online stores – to find their clients, build their brand, and engage their audience. • Synchronizing list and purchase data. • Setting up marketing automation to alert clients about items they forgot in their carts. • Tracking and segmenting audience based on purchase frequency and history. • Adding discounts codes generated in Shopify to your emails. When a person completes a purchase and agrees, the tool will automatically add them to your store’s MailChimp Shopify list. MailChimp tool also enables you to create a custom niche or select from their selection of pre-designed niches to identify your customers based on engagement, demographics, and signup date. After that, you can easily target a niche with their unique emails, reward loyal customers, incentivize lapsed buyers to return, and welcome new subscribers. The tool can also collect information on sales made and show this data in a more comprehensive report that you can use to measure your success or failure. This will help you to change your marketing tactics. 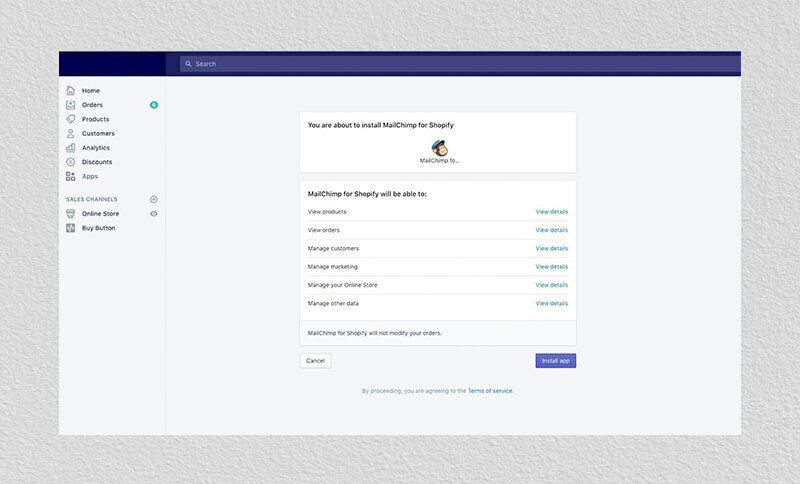 Note: MailChimp integrates with Google, Facebook, Instagram, Salesforce, Highrise, and Privy. Klaviyo app is a marketing tool that offers you the best of ease of use, speed, and functionality by providing you power at the entrepreneurial level. It is a cloud-based email marketing tool for all e-commerce businesses. The main features of Klaviyo include audience segmentation, performance reporting, and integration with multiple platforms. It offers integration with other tools such as payment processors, marketing tools, and e-commerce platforms to enable you to centralize your data from different sources. Klaviyo allows you to send out personalized email messages based on unique metrics such as customer’s interaction with past emails, viewing history, and purchasing frequency. 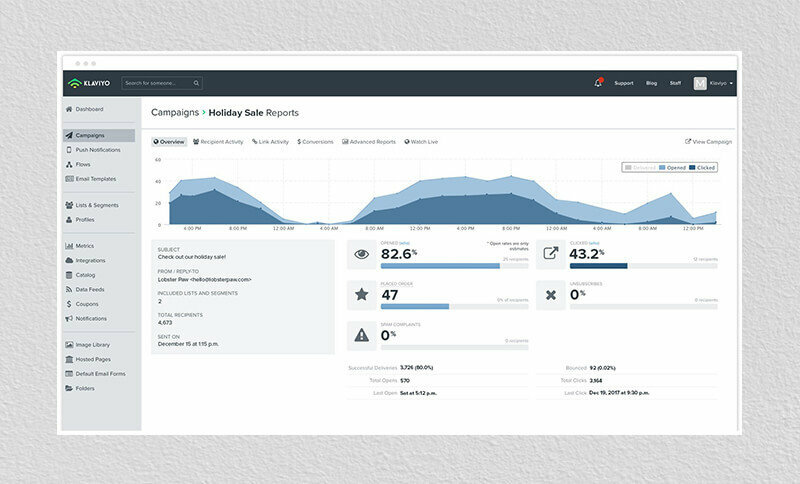 The tool has a reporting dashboard that enables you to evaluate performance based on refund requests, revenue generated (by advertising and email marketing campaigns), visitors’ activities, and order items. When it comes to collecting, storing, and using transaction and behavioral data, no one can match Klaviyo. You don’t need to make a tradeoff between accessing the results fast and having the best results possible. You can easily do both with Klaviyo. Note: All accounts are absolutely free up to 500 emails/250 contacts. Klaviyo also integrates with Recharge, Zendesk, Facebook Advertising, Swell Rewards, Aftership, and Smile.io. This email marketing tool will impress you with the different ways it adds your contacts. You can upload a file, add the contact individually, or even copy and paste them and it will load them into the right fields. 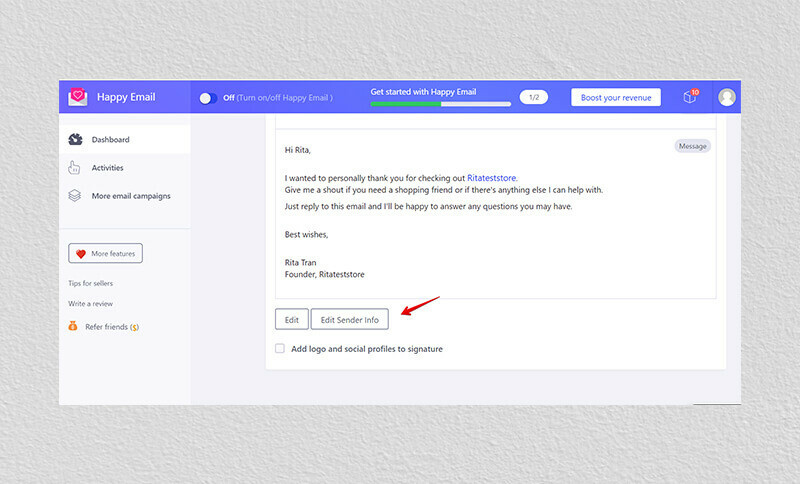 iContact also gives you the option of creating a sign-up form. The forms are quite simple; you don’t need to add images, branding, or anything else. Despite the limited feature of the forms, it allows for an unlimited number of fields, so you can target clients’ interests. This is especially useful if you offer a wide range of products or services and you want to promote them. Furthermore, you can segment your contacts in different ways, which enables you to target a particular population. For instance, you can alert clients to a sale in a specific region or target specific age groups. This tool also provides a spam checker which shows you which items to remove so your emails won’t head straight to the spam folder of your clients. Note: You not only send your email using iContact, but you can also post the newsletter to Twitter, LinkedIn, and Facebook. Omnisend is a flexible ecommerce marketing automation platform that uses an omnichannel approach to help growing ecommerce stores graduate their marketing efforts. Email marketing can be a limitation for growing businesses, so if you’re searching for cheaper MailChimp alternatives, Omnisend—with Google Customer Match Sync, Facebook Custom Audiences, automation workflows, segmentation, popups – can be your first option. Connecting your ecommerce store with Omnisend is simple: you just need to install the extension without any need for custom development. When creating segments you can use shopping behavior, demographic data. Also you can add any data you think might be relevant to your customer profile for targeting your customers better–their sizes, loyalty programme status or anything else. 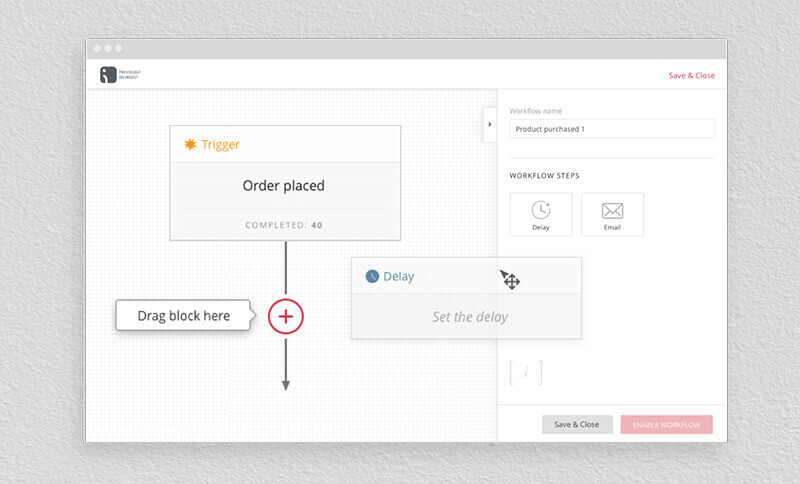 Omnisend provides predefined Automation workflows and of course, you can create unique automation workflows. Note: Omnisend integrates with most popular ecommerce platforms, with Facebook and Google. While there are other e-commerce marketing tools that can help you with your marketing campaigns, the above 5 tools are the most useful email marketing tools for your e-commerce business. So, look no further and add them to your marketing toolbox. Hopefully, they will come in handy and help you bolster your advertising efforts and results for more conversions and sales.